A Leap of Faith | Will My Dog Hate Me? Sentenced to doom because of a broken leg? Really? One of the best things about blogging is the virtual community you join. Its members include not only fellow pet bloggers, but also readers who want to communicate because you’ve struck a chord with them. Some of their stories and concerns are sad, including the one I recently posted about pet loss. But some, including this one by Carla T., are sweet and inspirational. I often refer to my decision to adopt Frankie, after years of dithering, as taking a leap of faith. It’s the same phrase Carla used when she described her decision to adopt Peanut. The following is distilled from a series of emails between us, including some in which I solicited pictures — aren’t you glad I did? — from Carla. Around the same time as you adopted your first dog, Frankie, I rescued my own first dog, ever. All of a sudden, the stars aligned, and this dog needed me to save him. I’ve learned over our four years together that it goes both ways. When I first approached the steel row of cages at the veterinary hospital where I worked back then, I saw a tiny creature, mostly hair, with enormous dark eyes. He stood on his three good limbs against the veterinarian’s kennel-jail, yelping and whining. His right front arm was bent unnaturally and hung limp, broken clean through. His third set of owners had only had him in their care for one day, so they didn’t feel an obligation to pay for his medical care and returned him to the shelter. Euthanasia was planned; this baby would die on his first birthday. When I opened the door of his cage, he inched toward me on his three good legs, still yapping but calming slightly. I gently lifted him into my arms and we fit. This is all it took for us to own each other. In my care, a year later, a large dog got away from his tether and attacked my little guy (Peanut is all of eight pounds), almost to his demise. Thank god for emergency veterinary care. Today, Peanut’s an awesome companion! He is loving and cuddly, but definitely has a mind of his own. Once he gained back his confidence after his myriad injuries, he really tested his limits (the canine version of teenager?). I also think he’s too smart for my own good! That pooch must be part animal, part gold-dust by now! Logically, the lengths to which I will go to for my little guy are ridiculous, but when I adopted him, I made him a promise that he would be worry-free for the rest of his life since he had such a tough start, and I’m trying to stay true to that word. ← Lily Greyhound, Departed Diva, Rest in…What? What a sweet story. I was especially touched by Carla’s promise that Peanut would be worry-free for the rest of his life. Yes, I agree. It’s hard to imagine that Peanut went through three owners by the time he was one. 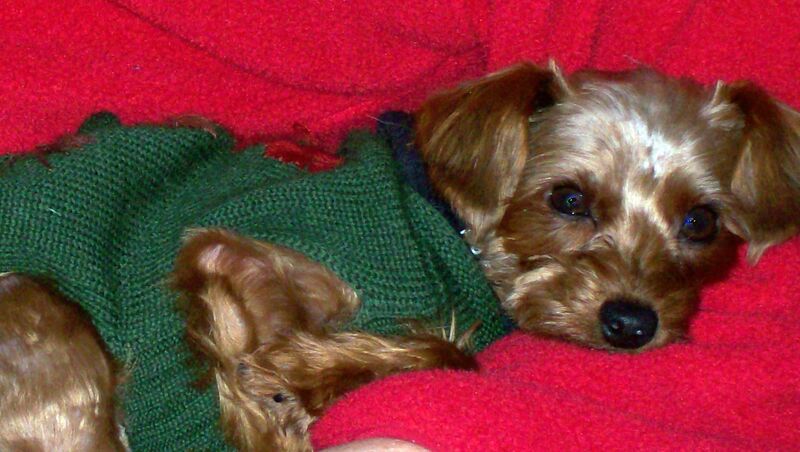 With that sweet little face — and at less than eight pounds — he must have encountered some mighty hard-hearted folks. Of course I feel that way about Frankie too! I just love that you still have this story up! I share it often…And Peanut’s doing so well as an older gent! Of course! How nice to hear from you. I’m so glad Peanut is doing well. 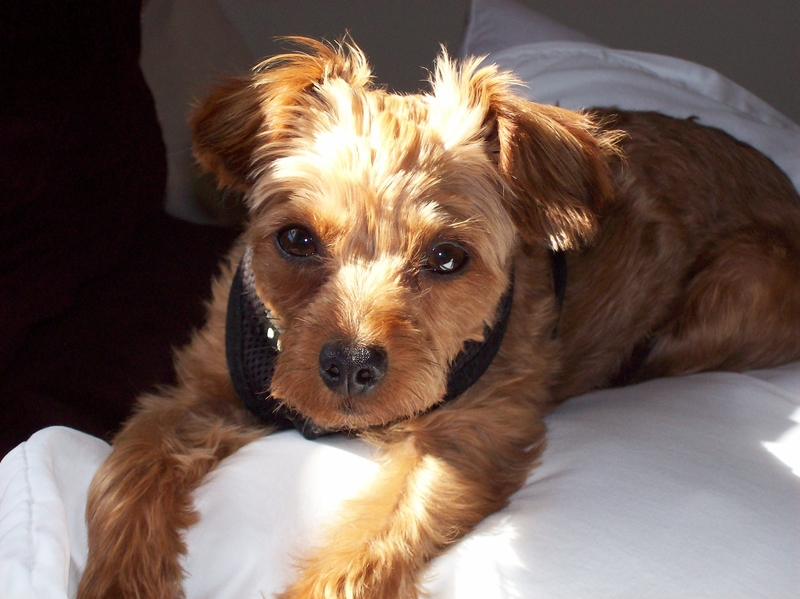 The stars did align and I know Peanut got lucky and I wish you good luck because I am a former Yorkie owner and the terrier DNA does allow them to be …let’s say….Independent? Touching story! I’m so glad Peanut found you, and you him! It sounds like making the commitment brought Carla as many gifts as Peanut himself did. Sometimes I think it’s just good for us to make promises and keep them. What a tear jerker! I can’t believe that people can be so heartless as to return the little one to the shelter rather than pay for care. I’m unconvinced some of these humans are really “human.” It speaks volumes about her that she rescued the little critter and then made that promise. I wish everyone would realize these little guys are not toys nor are they disposable. they are living breathing creatures that need love and affection and care just as we people do. I hope Carla and Peanut are very happy for many years to come, they have earned it! You are all so kind. Thank you for your good wishes! Glad you found each other- that first shot is crazy cute! Why is the internet full of stories that make my cry lately? This made my Friday! I do believe we (owners and our pets) pick each other. Sounds like Carla and Peanut are a true blessing to each other. Carla – what a great story! I am so glad that you two “fit”immediately. It’s amazing how that happens isn’t it? Peanut is a lucky, lucky dog, especially when you consider he went through 3 owners before finding his forever home. 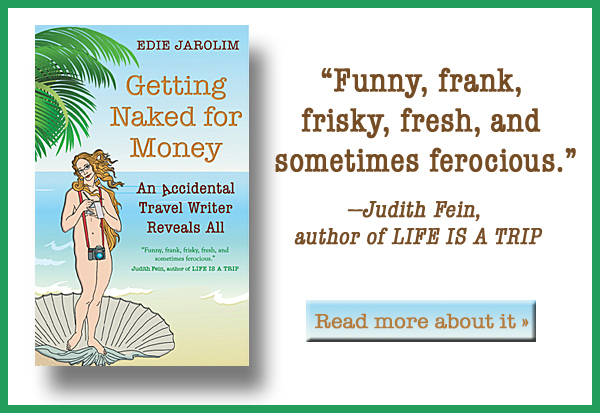 Thanks for sharing this story Edie!